Thanks to Aileen who introduced me to it, I've had a liking for seaweed snacks. One of the brands out there that sell seaweed snacks is Tao Kae Noi. They package crispy seaweed ready to eat. I just wish though that there was another name for their snack. 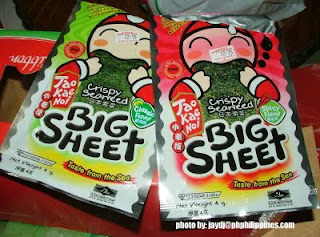 Cause if someone asks what I'm eating, I'd have to say "I'm eating a Big Sheet". Oh my ! Ooohh! Thanks to the Google micro-kitchen where I discovered this, actually now I remember, it was Hanson who force-fed it to me LOL. @aileen yeah... i remember that too. that's how i got to like it, when you gave me a sample. Good thing I found out it's also available in the local supermarkets. yey ! My tita said it's like eating crafted paper. LOL! Ay pasingit naman sa sweetness niyo. Have a colleague who just came Malaysia who gave me lots of this as a pasalubong. I didn't quite know how to 'consume' it so it's still here on my station, totally ignored. hehe.